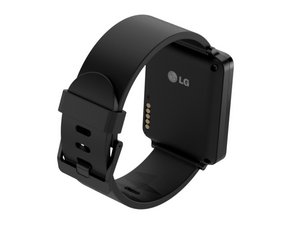 The LG G Watch was not just the first offering from LG that featured Android Wear, it was the first watch to feature Android Wear at all. Packed with a built in microphone, this watch introduced to the world Android Wear, and its Google Now featured magic. The look of this watch brought in a lot of criticism from everyone. However, the uptake was there, and you did start to see people wearing this. The main problem this watch has is that it is a bit bulky for what you are used to as a watch. While there are plenty of big watches for men out there, you don’t quite see any big watches available for women. While the main body, which is a rectangle is big, it is actually the thickness that makes it feel bulkier. Being 9.95mm thick, it is actually thicker than many mobiles. However, once you go past the size, there is a lot to be liked in this watch, so lets focus on rest of the ‘look’. As mentioned already, there is a screen in the front, and a microphone at the bottom of the watch. At the back are some gold spots, that fit into a charging cradle magnetically, giving you an instant connection. Your total contact is via the touchscreen, and there are no visible buttons at all. It does have the option of replaceable straps, so customization is up to you. Weight wise, it isn’t any heavier than most watches. I would add that I found it too big to sleep in. You need a charging cradle to charge this watch, which makes it more awkward than your regular microUSB enabled charging devices. However, I can understand the need for one, since the watch is IP67 rated. As such, LG have packed in two charging cradles with this, so you can have one at home, and one at work, or one in your backpack as a backup. A good idea! The magnetic cradle does ensure that the watch fits in well, and you don’t have to fiddle with it. IP67 rated? So I can take it in the shower? Yes, yes you can. Or for a swim. However, being touchscreen operated, it isn’t a great idea. Water and touch screens don’t mix well, so you may end up calling somebody or something equivalent in there, as the water hits the screen. Of course, it all depends on what apps you load on it. 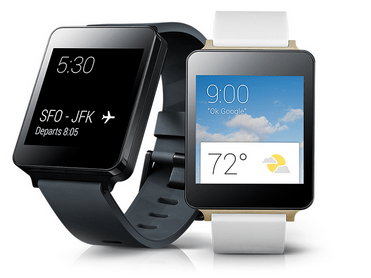 You need the Android Wear app, which once installed, looks for nearby devices. You click on the watch you think it is, both devices show the same code, you accept on both, and off you go. Once paired, you do not need to repeat the process. Interestingly, my Pebble also shows in the Android Wear app, and the LG G watch also shows up in the Pebble app. They don’t connect in both, but the fact that Pebble is trying to talk to Android Wear is interesting. Does one install apps through Android Wear app? No. Not really, though it can point you towards them on the Play Store. Easier to just go and find apps on the Play Store and install them from there. As you install apps (and watch faces) on your phone, they automatically appear on your watch. What is so smart about this watch? This watch, or perhaps all of Android Wear! So, what does this really do? It brings access to every single notification available on your phone, and lets you interact with it, or dismiss it. Unlike the Pebble, though, if you dismiss a notification on the watch, it gets dismissed on your phone too. It also allows the same level of interaction you get from your notifications. For example, if it is a mail, you can mark it as read, delete it, archive it, or reply to it. You will need to ‘speak’ the response though. If it is a call, you accept, but you still need to talk on the phone. If it is an Instagram notification, you can only really open it on the phone. You get the idea. In very simplistic terms, it is just an extension of Google Now, with all its glorious voice commands. This does mean that you will need to activate Google Now on your mobile phone. Once activated, it brings you all the information Google Now brings, and lets you do all the things you can do with Google Now, for example send texts, write emails, set reminders, etc. Much like regular Google Now, it gets better (or your phone gets better) as it gets used to your schedules. For example, after a week or so of wearing this, it lets me know at the right time what the traffic to work will be like, and similar for when I have to get back. It also features other notifications from Google Now, such as news, sports events, appointments, etc. Do the notifications get annoying? It vibrates to give you notifications, and it is a fair concern. Do the notifications get annoying? Not for me. It has a very gentle vibration in it. This compared to the Pebble, which has a very strong vibration, enough to wake you up while you sleep! Now, you can pick and choose which apps give you notifications, and you can block certain apps from appearing on the watch, but generally, despite me getting lots of notifications, it wasn’t an unpleasant experience. In fact, I got quite used to dealing with everything by looking at my watch, and not bothering with the phone at all. What about the screen? Is it always on? Shake to wake? What’s it like in the sun? Woa, woa… too many questions. The screen is good, a decent size for the information you get. The fonts are designed to allow you to scroll through and see enough info. Being a touch screen, it is the only interface you have with the watch. The screen is always on, and most watch faces (I say most, all I have tried in my case) have two modes, an active mode and a stand by mode, which allow you to see information. A shake does wake it, and puts it in active mode. This is where you can say ‘OK GOOGLE’ and ask it to do various tricks for you. It doesn’t work best in the sun, but there is a sun light viewing mode, which makes it extra bright. It deactivates after a little while, but since we live in cloudy Britain, it hasn’t been too much of a nuisance. Could be a different story if you lived in a desert. There is, also, a cinema mode available, for times where you don’t want a distracting light on your wrist. That, as the name suggests, dims the watch right down. Always on screen? How long does it last then? Very comfortably for a day. I have made it last two days over the weekend, where I used my phone/watch a little less. It comes in black and white gold, and retails for £159. I never thought I’d get attached to this watch, but since I have been trying it, it has been on my wrist apart from when I sleep. It gets more and more useful, as time goes on, and the various apps that are available help too. Battery life is okay, but you will have to more or less charge it every day. Definitely an exciting start to the Android Wear journey!